Raymond T. Nimmer, Jeff C. Dowd. Modern licensing law. 2011-2012 ed. Thomson/West, c2011. 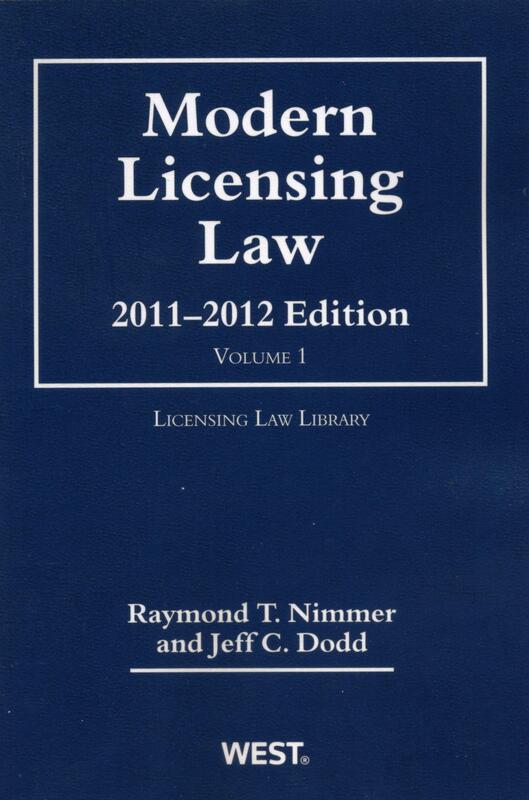 This two volume work, co-authored by Dean Raymond Nimmer, treats licensing law as a distinct body of law. The authors discuss the laws, decisions, traditions, and practices that comprise the law of licensing as it is practiced today and discussions cover contract, property, and public policy doctrines. It explains financing intellectual property assets, including new developments in UCC Article 9, emphasizes modern law developments, and includes an extensive discussion of licensing in digital and online industries. Dorothy Evensen, Carla D. Pratt. The end of the pipeline : a journey of recognition for African Americans entering the legal profession. Carolina Academic Press, c2011. This book contains a foreword written by Professor Michael Olivas. The book addresses how some African-American attorneys, recently admitted to the bar, successfully navigated what research suggests is a very precarious pipeline to the legal profession. The response to this question entailed a journey that spanned some three years, over fifty informants, and a dozen or so researchers and scholars who study the intersections of education, race, and efforts to achieve social equity. Intellectual property, competition law and economics in Asia / edited by R Ian McEwin. Hart Pub, 2011. Stephen Elias, Albin Renauer, Robin Leonard. How to file for Chapter 7 bankruptcy. 17th ed. NOLO, 2011. Amy Jane Longo, Allen W. Burton, Allan D. Johnson. Electronic discovery practice under the federal rules. 2011 ed. BNA Books, c2011. Reflections on the UN Declaration on the Rights of Indigenous Peoples / edited by Stephen Allen, Alexandra Xanthaki. Hart Pub., 2011. Ruti Teitel. Humanity's law. Oxford University Press, c2011. Joan Marshall, Judy Speer-Gamino. Best practices in government law course. State Bar of Texas, c2011. Making sense of the 2010 estate tax legislation / edited by Ronald D. Aucutt, Dennis I. Belcher, Charles D. Fox IV. CCH, c2011. Ralph H. Folsom. Principles of European Union law. 3rd ed. West, c2011. Cordula A. Meckenstock. Investment protection and human rights regulation : two aims in a relationship of solvable tension. Nomos, 2010. Franchise law compliance manual / edited by Jeffrey A. Brimer. 2nd ed. American Bar Association, Forum on Franchising, c2011. Angie Junck, et al. Families & immigration : a practical guide. 3rd ed. Immigrant Legal Resource Center, c2011. Impact of medical device regulation on jobs and patients : hearing before the Subcommittee on Health of the Committee on Energy and Commerce, House of Representatives, One Hundred Twelfth Congress, first session, February 17, 2011. Recent developments in Egypt and Lebanon : implications for U.S. policy and allies in the broader Middle East : hearing before the Committee on Foreign Affairs, House of Representatives, One Hundred Twelfth Congress, first session, February 9 and 10, 2011. The climate crisis : national security, public health, and economic threats : hearing before the Subcommittee on Energy and Environment of the Committee on Energy and Commerce, House of Representatives, One Hundred Eleventh Congress, first session, February 12, 2009. Ensuring the safety of our nation's pipelines : hearing before the Subcommittee on Surface Transportation and Merchant Marine Infrastructure, Safety, and Security of the Committee on Commerce, Science, and Transportation, United States Senate, One Hundred Eleventh Congress, second session, June 24, 2010. Five years later : lessons learned, progress made, and work remaining from Hurricane Katrina : hearing before the Ad Hoc Subcommittee on Disaster Recovery of the Committee on Homeland Security and Governmental Affairs, United States Senate, One Hundred Eleventh Congress, second session, field hearing held in Chalmette, LA, August 26, 2010. Making sense of the numbers : improving the federal financial reporting model : hearing before the Subcommittee on Government Organizations, Efficiency, and Financial Management of the Committee on Oversight and Government Reform, House of Representatives, One Hundred Twelfth Congress, first session, February 16, 2011. Mismanagement of contracts at Arlington National Cemetery : hearing before the Ad Hoc Subcommittee on Contracting Oversight of the Committee on Homeland Security and Governmental Affairs, United States Senate, One Hundred Eleventh Congress, second session, July 29, 2010. Emerging risk? : an overview of the federal investment in for-profit education : hearing of the Committee on Health, Education, Labor, and Pensions, United States Senate, One Hundred Eleventh Congress, second session, on examining an overview of the federal investment in for-profit education, June 24, 2010. Bailouts and the foreclosure crisis : report of the Special Inspector General for the Troubled Asset Relief Program (SIGTARP) : hearing before the Committee on Oversight and Government Reform, House of Representatives, One Hundred Twelfth Congress, first session, January 26, 2011. Improving federal employment of people with disabilities : hearing before the Oversight of Government Management, the Federal Workforce, and the District of Columbia Subcommittee of the Committee on Homeland Security and Governmental Affairs, United States Senate, One Hundred Twelfth Congress, first session, February 16, 2011. Global maritime piracy : fueling terrorism, harming trade : hearing before the Subcommittee on Terrorism, Nonproliferation, and Trade of the Committee on Foreign Affairs, House of Representatives, One Hundred Twelfth Congress, first session, June 15, 2011. Reforming the United Nations : the future of U.S. policy : hearing before the Committee on Foreign Affairs, House of Representatives, One Hundred Twelfth Congress, first session, April 7, 2011. After injury, the battle begins : evaluating workers' compensation for civilian contractors in war zones : hearing before the Subcommittee on Domestic Policy of the Committee on Oversight and Government Reform, House of Representatives, One Hundred Eleventh Congress, first session, June 18, 2009. Are federal workers underpaid? : hearing before the Subcommittee on Federal Workforce, U.S. Postal Service, and Labor Policy of the Committee on Oversight and Government Reform, House of Representatives, One Hundred Twelfth Congress, first session, March 9, 2011. Pushing the envelope : the looming crisis at USPS : hearing before the Subcommittee on Federal Workforce, U.S. Postal Service, and Labor Policy of the Committee on Oversight and Government Reform, House of Representatives, One Hundred Twelfth Congress, first session, March 2, 2011. National Science Foundation fiscal year 2007 budget request, programs, and science priorities : hearing before the Subcommittee on Science and Space of the Committee on Commerce, Science, and Transportation, United States Senate, One Hundred Ninth Congress, second session, May 2, 2006. Competition and consolidation in financial markets : the NYSE-Deutsche Boerse merger : hearing before the Subcommittee on Intellectual Property, Competition, and the Internet of the Committee on the Judiciary, House of Representatives, One Hundred Twelfth Congress, first session, June 13, 2011. Universal service : transforming the high-cost fund for the broadband era : hearing before the Committee on Commerce, Science, and Transportation, United States Senate, One Hundred Eleventh Congress, second session, June 24, 2010. Oversight of Dodd-Frank implementation : a progress report by the regulators at the half-year mark : hearing before the Committee on Banking, Housing, and Urban Affairs, United States Senate, One Hundred Twelfth Congress, first session ... February 17, 2011. The role of TANF Program providing assistance to families with very low incomes : hearing before the Subcommittee on Income Security and Family Support of the Committee on Ways and Means, U.S. House of Representatives, One Hundred Eleventh Congress, first [i.e. second] session, March 11, 2010.